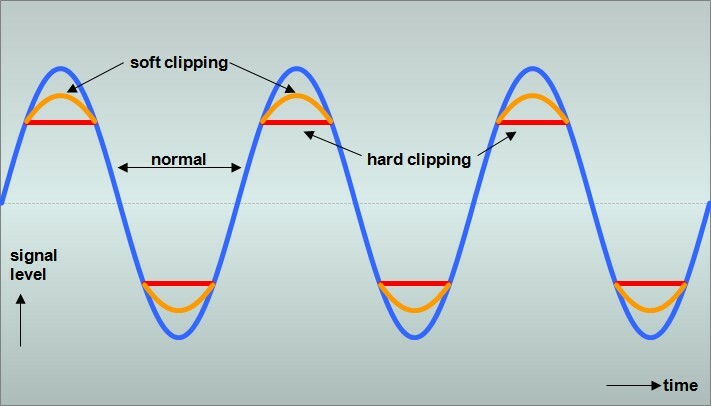 As you can see from the diagram of the waveform above, soft clipping clips the peaks somewhat, while hard clipping pretty much lops of the peaks leaving a narrow dynamic range. This article describes clipping quite well. So what does this have to do with drive pedals? Well, let’s take stock of the types of drive pedals available to you. First up is the booster pedal. Basically this is simply a gain boost that will add gain to your signal. It’s either used as volume boost or, if you’ve set your amp at edge of overdrive, the booster will take it over the edge into overdrive. Note that a booster is most effective with a tube amp. This will produce a soft-clipping waveform, and the distortion will come entirely from your amp. Next we have overdrive pedals. These pedals come in LOTS of different flavors, but typically combine a gain boost plus a soft-clipping circuit. 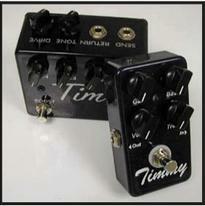 Most designs out there are based upon the venerable TubeScreamer design, though there are several that use proprietary approaches, such as the Paul Cochrane Tim and Timmy pedals (the Timmy is the best OD I have every played). Here, the distortion can come from both pedal and amp. Then we have distortion and fuzz pedals. I’m lumping them together because they’re both hard-clipping devices, though fuzz really gets into that square-wave distortion where the signal gain is really amplified then severely clipped, with really aggressive emphasis on harmonics and overtones. You can get some pretty far-out sounds with a fuzz. Also, just like with overdrive pedals, many distortion pedals also provide a gain boost knob, though to produce distortion, they don’t really need it. Once you turn a distortion pedal on, it produces distortion right away with no help from the amp. So which do you choose? Well the only good answer I can come up with is this: It’s the one that sounds most pleasing to you and fits your application, and notice I’m not putting on my normal smiley-face to indicate a “jk.” To come to my own “comfort zone” with drive pedals, I probably played a couple of hundred of them – maybe more – to finally arrive at the four drive pedals that I have on my board. I have 5 or six drive pedals that are actually collecting dust; a couple of which are worth a pretty penny, and I’m not using them at all – craigslist here I come! In any case, I have all three types of drive pedals on my board: Timmy Ovedrive, Tone Freak Abunai 2 Overdrive, EWS “LBD” Little Brute Drive (distortion), and a Creation Audio Labs Mk.4.23 booster. I’ll describe how I use each so you may perhaps glean some insight on making a choice. When I want crunch; I mean rock crunch at any volume, I use my EWS Little Brute Drive. I look at this as a classic distortion pedal. It has a single knob to adjust the internal gain and can produce some pretty wicked distortion sounds. I use this typically with a purely clean amp, and let the LBD provide all the distortion. With my booster pedal, I use it a few different ways. When I just want my amp tone alone and just want my distortion to come entirely from my amp, I’ll use my booster to take it into overdrive. I find it most useful when I’m playing a Strat and want to do a quick lead. But I also use it with my overdrive pedals and LBD. With my overdrive pedals, I use it to stack on top of my overdrives so I’m really slamming the front end of my amp. With my vintage Marshall-style amps, this gets the pre-amps totally saturated, and in turn drives my power tubes into saturation and compression. It’s a cool effect. Used with my EWS Little Brute Drive, since the amp is clean, I use it for lead breaks to boost my volume just a tad so I can play over the rest of the band (and no, I don’t stomp on them, but it’s easy to get lost in the mix when we’re all together 🙂 ). Please don’t take my mention of the pedals above necessarily as endorsements. I love ’em all, which is why they’re never leaving my board. But I arrived at this combination of pedals literally after years of evaluation. These are the pedals that I found work the best with my guitars and “go-to” amps (which are vintage Marshall-style amps made by Aracom Amps). YMMV… For my Fender amps, such as my Hot Rod Deluxe, I typically only use my LDB, especially with my Hot Rod Deluxe, which doesn’t have a very nice overdrive sound to my ears – it’s much better clean. Just as I mentioned in my previous article about making your decision on a tube amp with respect to your particular application, the same holds true with drive pedals. You have to think about what you want to achieve before buying one. But here’s an extra piece of advice with respect to drive pedals: Because drive pedals generally run under $200, it’s easy to get them; and that’s the problem. You want to be extra careful in your buying process because you will end up like me, having a couple of grand worth of drive pedals that end up collecting dust. I know it sounds rather mundane, but in order to rock, you have to do your homework! ROCK ON! Pigtronix Class A Boost is the final word in high performance guitar preamps. This pedal’s elegant exterior and single knob layout cloth an ingenious “Class A” J-FET design that will fatten up the sound of any instrument or sound source. Featuring discreet transistor topology (no opamps) this device can boost passive or active pickups and even line level signals up to 20db without ever clipping. Perfectly flat frequency response from 20Hz to 20kHz ensures that your instrument’s tone and expressive character remain intact as signal power is increased. 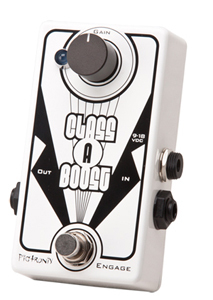 The Class A Boost’s noise free performance allows you to put the effect anywhere in your pedal chain. It adds punch and extra output when placed after a classic overdrive or will happily push your gain pedals into new levels of saturation. The Class A Boost is also ideal for hitting the front end of a tube amp to achieve an added layer of sweetness and fat tone without unwanted clipping or noise. The Class A Boost runs fine on a standard 9-volt supply, but ships with a Pigtronix 18-volt adapter in order to achieve superior headroom and maximum punch. Make your sound 1 louder with this handsomely dressed, J-FET masterpiece from Pigtronix. Pigtronix Class A Boost carries a list price of $149 and is available now at Pigtronix dealers everywhere. 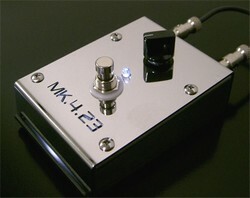 Check out the Class A Boost and the whole line of 2011 Pigtronix effects at http://www.pigtronix.com. I’m a big proponent of boost pedals, especially when used to slam the front end of a tube amp to push it into full-on overdrive. What’s attractive about this particular pedal is that it is Class A – at least from an audiophile’s perspective – which means that it will not clip throughout its operating range. Don’t confuse this with the definition of Class A for an amplifier. They’re two different things. Here’s a great explanation of Class A operation with respect to amps. For more information, visit the Pigtronix Class A Boost page!